To mark Girls in ICT Day, Microsoft has today released research showing the critical importance of role models in generating interest in STEM amongst young girls in Ireland. 46% of girls surveyed reported an interest in science, technology, engineering and mathematics when inspired by a female peer, in comparison to 38% of girls who don’t. The findings also revealed that three out of five girls in Ireland with strong role models in their lives can imagine a future career in STEM. However, only around 2:5 (42%) of Irish young women with a STEM role model actually work in STEM subjects, showing an ‘opportunity gap’ to convert the passion in the classroom into a future STEM career. With Ireland seeking to become Europe’s STEM leader by 2026, there is an urgent need to encourage more girls to become interested in technology-enabled careers. For today, only 30% of Europe’s ICT workforce is made up of women. Microsoft unveiled the research at a special event hosted at the company’s new campus at One Microsoft Place. 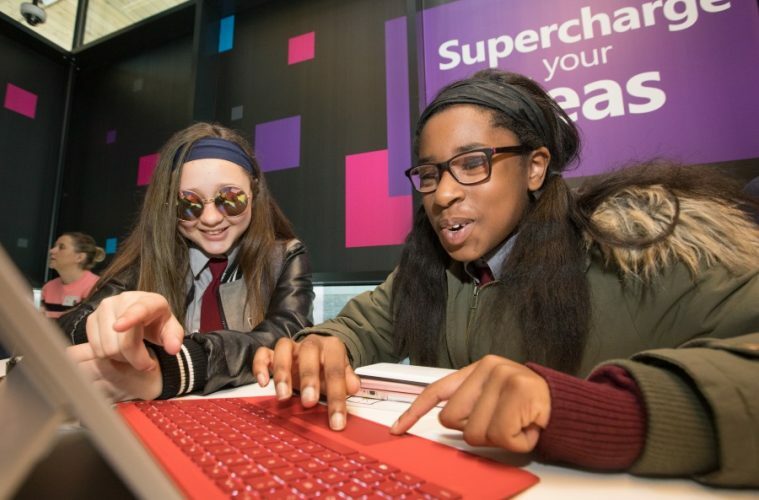 6th class girls from three schools were invited to DreamSpace – Microsoft’s new innovation and education hub – to open their eyes and minds to the possibilities that technology can create and to empower girls to succeed into the future through STEM subjects. Students from St. Thomas’s SNS in Tallaght, Sacred Heart NS in Clondalkin and Guardian Angels NS in Blackrock had the opportunity to meet with young successful women who have blazing a trail by harnessing the power of creativity and technology. With the research findings in mind Microsoft invited some guest speakers to deliver 5-minute talks to students about their pathway to success. Teenager Kate Madden showcased how she helped bring FenuHealth to global success and Sara Ryan, the 24-year-old COO of Junk Kouture outlined how she harnessed technology to bring Irish creative design to everyone’s attention. Students also heard from young Microsoft graduate employee Paula Kiernan about the job she does with Microsoft and her education background. Bernadette Thalhammer and Barbara de Kegel from Havok talked to students about new innovations and what exciting elements a day at work involves. In marking Girls in ICT Day Cathriona Hallahan, Managing Director, Microsoft Ireland said: “Every young person deserves the opportunity to participate in our digital world and develop a passion for technology. However, we face a significant challenge in encouraging more girls to become interested in technology-related careers. Despite girls becoming interested in technology around the age of 11, girls start to lose interested in STEM subjects around the age of 15. “Today’s research points towards the importance of role models in enhancing interest in STEM subjects amongst young girls and closing the gender gap in Ireland’s ICT workforce. We only recently opened DreamSpace and announced our commitment to bringing 100,000 students through the doors over the next four years to give them the latest technology experience and open their minds to the fact that whatever their future holds technology will be at the heart of it. “With the research in mind we wanted to bring speakers in that the primary school students could relate to. By showcasing some of Ireland’s most inspiring young female leaders from innovative sectors the hope is that they inspire the students to think differently about technology and STEM subjects generally as they make the move from primary to secondary school this coming year. Microsoft has invested €5m to develop DreamSpace and is committed to bringing 100,000 primary and Transition Year students and their teachers to One Microsoft Place over the next four years to participate in the DreamSpace experience. Students and teachers who visit will have the opportunity to experience a series of creative and innovative tasks through STEM and will leave equipped with critical collaborative, problem-solving and learning skills. By engaging students in a series of creative and innovative tasks, Microsoft is hoping to shift their perception about the role technology will play in their future. Microsoft is inviting all schools to register their interest for a DreamSpace visit by logging on www.dreamspace.ie. You can see a video from the day by clicking here.